Chip maker contracts local horizontal auger boring company to install waterline. September, 2017 — SSC Boring, a Phoenix based underground construction company began construction on a new underground waterline for Intel’s water recycling plant in Chandler. 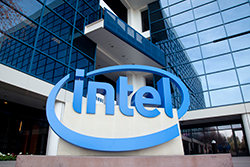 Intel has spent over $150 million building and expanding their water recycling plant since the 1990’s. 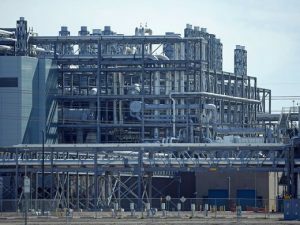 The micro-chip manufacturer uses the plant to treat its own wastewater as part of its smart corporate water conservation program. It’s important for businesses like Intel to actively participate in water conservation and invest in aquifers, water treatment facilities, and related infrastructure projects as the Colorado River and other water sources continue to decrease in volume. SSC is proud to have been selected for this project. 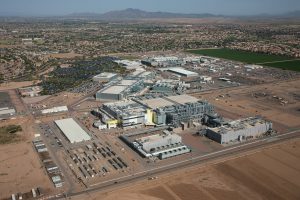 SSC’s expertise in Arizona soils enabled the company to successfully complete this project on time and within scope while meeting Intel’s complex needs and high standards. SSC was contracted to horizontally bore 119’ under a major driveway to install a 24’’ waterline. The trenchless construction method used was very important to Intel, as it allowed traffic flow for Intel’s 11,000+ Chandler employees to remain uninterrupted while water line is installed. “We take pride in working on projects like these that display what positive corporate responsibility looks like”, says Arvid Veidmark III, Vice President of SSC Boring. Arvid mentions, “It’s really special when we can help a city and corporation collaborate together on utility infrastructure projects that improve local area communities, promote water conservation efforts, and set an example for others”. Arvid adds, “It’s also really nice for everyone involved when trenchless construction methods do not impact traffic flow at our customer’s business locations”. Intel funded and lead development of an advanced reverse osmosis water treatment facility (in partnership with the City of Chandler) to treat process wastewater from its semiconductor fabrication plants in Arizona. This process wastewater is treated to drinking water standards and returned to the underground aquifer to replenish the groundwater supply. This highly efficient process recovers, treats, and returns a portion of Intel’s rinse waters to the aquifer. The manufacturing facilities Industrial Water Management (IWM) system consists of several innovative and advanced facilities systems that reclaim process and facilities wastewater. This reclaimed wastewater is supplied to facility equipment where most other industries would use fresh city water. This facility’s systems allow the facility to operate without impacting the local water infrastructure. Through the implementation of this key strategy, Intel and the City of Chandler have been able to return more than 3.5 billion gallons of drinking quality water to the underground aquifer for eventual reuse since project inception. The new waterlines SSC has been contracted to construct will enhance this facilities capability. Since 1969, Specialized Services Company (SSC) has been recognized as one of the top underground construction companies serving Arizona. SSC has become a leader in underground utility installations using horizontal auger boring, micro tunneling, and trenchless pipe lining, as well as providing vacuum excavating and utility potholing services. SSC Boring places underground utilities in locations where it’s not practical or possible to use open cutting. SSC’s subsurface utility engineering services can deliver a utility without open cutting a road, railway, canal, freeway or parking lot, through the application of trenchless technology.